Dr. Larry Thompson, Stanford University, and Ann Davidson, former caregiver and author of "Alzheimer's, a Love Story: One Year in My Husband's Journey" and "A Curious Kind of Widow: Loving a Man with Advanced Alzheimer's", co-host this section to explain the importance of stress reduction for caregivers and how stress is related to our thoughts. 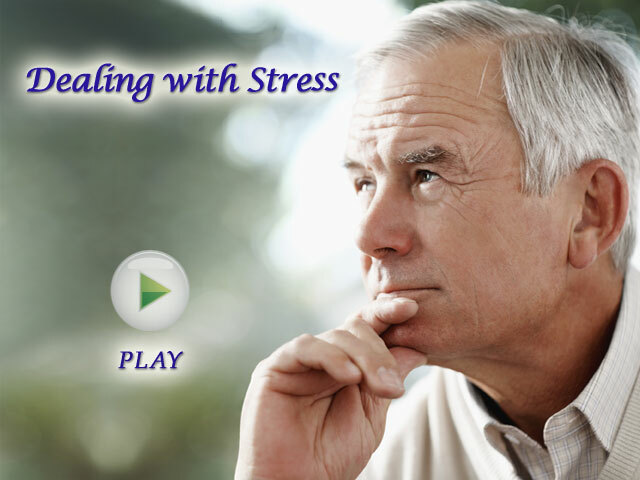 They introduce effective stress reduction strategies with short video examples, guided exercise and comments from other specialists: Heather McKay, dementia care specialist, and Teepa Snow, dementia care and education specialist. Caregivers for dementia patients experience much higher stress level than typical everyday stress. General stress reduction techniques may not work for their situations. In this section, you will learn how to identify, challenge and replace unhelpful negative thoughts, and recognize stress signals and unhelpful thought styles to deal with stresses more effectively. Step by step guidance is provided to change negative thinking and how to use "Thought Record" as a stress journal.